Politicians in Washington make lofty promises about cutting waste and reducing or eradicating fraud in federal spending. Their promises are enough to fill and launch a hot air balloon each year, but what doesn’t get off the ground are actual efforts to do anything about the waste, fraud and abuse that plague our federal programs and government transfers. Just how much does waste cost us taxpayers? $100 billion in improperly transferred benefits. That’s the size of Texas’s budget or the budgets of Massachusetts, New Jersey, and Tennessee combined! 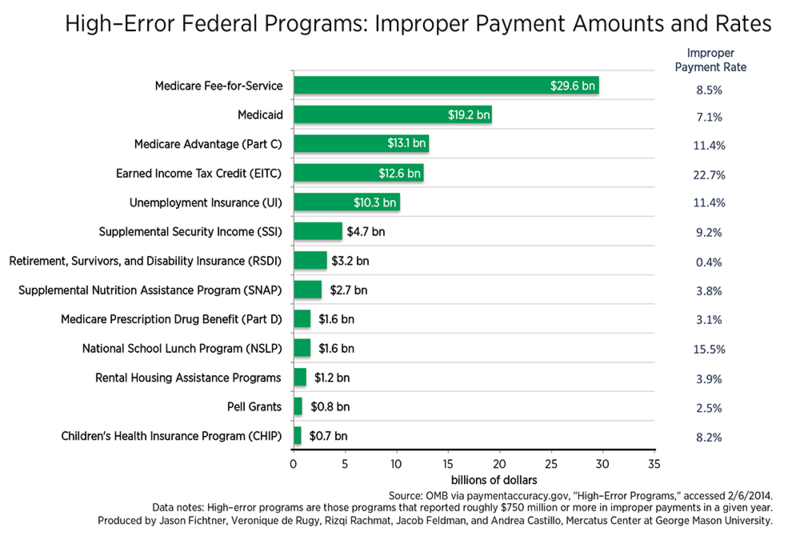 The Office of Management and Budget released its “High-Error Programs Report” which highlights federal programs that transfer benefits to Americans improperly, by how much and at what rates. Some programs, like the Social Security Retirement, Survivors, and Disability Insurance (RSDI) programs, have improper payment amounts that are relatively high when compared to their improper payment rate. While $3.2 billion was improperly spent on Social Security benefit payments in 2012, the large overall amount of benefit payments made by the agency ($785.8 billion in 2012) means that the improper payment rate is only 0.4 percent. Other programs, like the Earned Income Tax Credit (EITC), not only have a high improper payment amount but also a relatively high improper payment rate. The $12.6 billion in misspent EITC outlays represents a substantial portion, 22.7 percent, of total EITC spending—suggesting that the EITC is prone to fraud, waste, and abuse. As the chart displays, Medicare Advantage (Part C), Unemployment Insurance (UI), and Supplemental Security Income (SSI) face problems similar to the EITC, with anywhere approximately from one in nine to one in eleven dollars in these programs being disbursed improperly. The three largest programs in terms of improper spending amounts are all health-care related. Medicare Fee-for-Service, Medicare Advantage (Part C), and Medicaid top the chart with a combined $61.9 billion in improper payments. As the chart Mercatus assembled demonstrates, health-related programs are the biggest culprits for waste, fraud, and abuse. When you consider that these programs will expand under ObamaCare, we can expect even greater malfeasance in the future. And what will ensure that similar occurrences won’t also plague new healthcare-related programs under ObamaCare? Americans doubt the government’s ability to be efficient and effective in implementing policy. Standing in line at a registry of motors vehicle usually is a good reminder and so is this report. The bigger crime though is that no one is working correct these mistakes or try to reclaim the lost tax dollars. As government grows through massive new legislation and programs such as ObamaCare, its enforcement and oversight duties haven’t adapted. So why do we as Americans continue to put up with this mismanagement? Why do we buy into arguments that the government should initiate new programs with no demonstration of accountability, oversight, and enforcement? We are not as free with our own purse strings, the government coffers should be no different. What are you going to do?